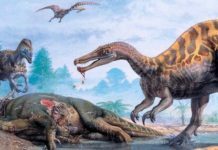 The Carboniferous Period ran from about 360 million years ago to about 300 million years ago. 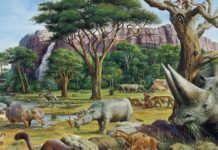 It is a period on the prehistoric timeline that is under appreciated but is one that has affected humanity greatly especially during the Industrial Revolution. That’s because this period was given its name because of the deposits of coal that existed throughout Asia, Northern Europe, and parts of North America. 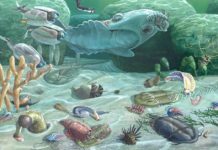 While the term “carboniferous” is used to describe the period throughout the world, in the U.S it has been separated into the Mississippian Epoch and the Pennsylvanian Epoch. The Mississippian is used to describe the early part of this period and Pennsylvanian is used to describe the later part of this period. This period had what can be considered a tropical climate. It was warm and was more humid than it is today. Seasons, if there were any, couldn’t be told apart. This has been determined by scientists who studied fossilized plants and realized that they didn’t have growth rings. This would suggest that the climate was uniform. Warm marine waters would often flood the dry land and many of the plants would fall into this water and turn into peat after they have completed their life cycle. This peat would eventually become coal over time. Lepidodendrales, or scale trees, were abundant during this time and many of the grew to be about 1.5 meters in diameter (4.5 feet) and about 30 meters high (90 feet). Other plants that existed during this time were horse-tails known as Equisetales; club mosses known as Lycopodiales; ferns known as Filicales; scrambling plants known as Sphenophyllales; cycads known as Cycadophyta; seed ferns known as Callistophytales and conifers known as Voltziales. 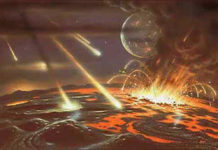 During the Carboniferous Period, Priapulids first entered the scene. These marine worms grew to a large size due to the higher concentrations of oxygen in the Earth’s atmosphere and because of the moist, swampy environment. These factors also allowed millipede-like creatures known as Arthropleura to get about 2.6 meters (7.8 feet) in length. Insect groups also became to emerge and diversify during this period. Some of these include griffin-flies known as Protodonata and dragon-fly like insects known as Meganeura. Early cockroaches known as Dictyoptera also appeared during this time. 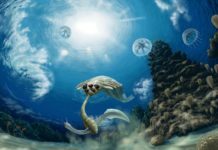 Life in the oceans during the Carboniferous Period consisted mainly of various corals (tabulate and rugose), Foraminifera, brachiopods, Ostracoda, echinoderms, and microconchids. These weren’t the only types of marine life, however. 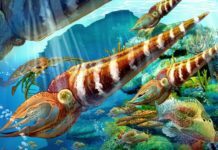 There were also sponges, Valvulina, Endothyra, Archaediscus, Aviculopecten, Posidonomya, Nucula, Carbonicola, Edmondia, and trilobites. During the beginning of this period, global temperature was fairly high – about 20-degrees Celsius (68-degrees Fahrenheit). As the period wore on, though, temperatures began to cool to about 12-degrees Celsius (about 54-degrees Fahrenheit). This cooling of the atmosphere, coupled with it beginning to dry out, probably led to the Carboniferous Rainforest Collapse. This climate change event fragmented the rainforest of the world and then eventually destroyed most of them.